The Missio Global School of Ministry is a partnership between Missio Global Ministries and local churches around the world. The MGSOM is a valuable and productive training program that is based in the local church. It is a proven tool that churches can use to equip their congregation and develop emerging leaders. The sponsor local church is the laboratory where the students serve and complete ministry projects. In this setting, the students learn from the experience and wisdom of their church leaders. The goal of MGSOM is to create a fruitful learning community in the local church that will develop future leaders and ultimately plant new churches. A student team project outreach to a nursing home. MGSOM enables local church leadership to equip and mentor developing leaders in their church in the same way that Jesus trained his twelve disciples. 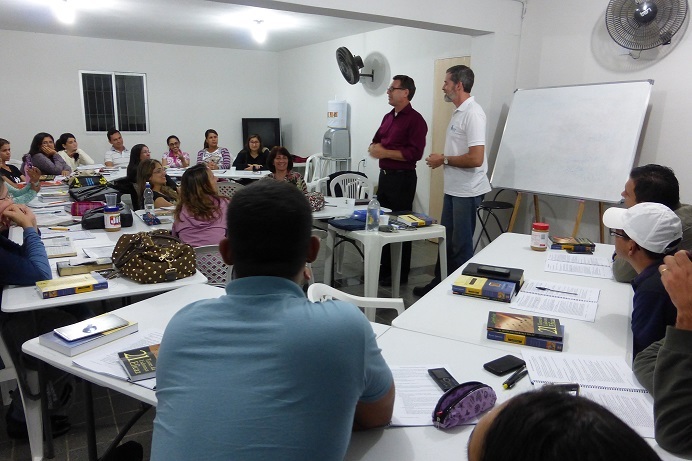 The classes are taught by the local church leadership. It is not video-based training. MGSOM is a school of ministry, not just a Bible course. The host church is the laboratory where students serve and complete ministry projects under the supervision of the local church leadership. The curriculum provides a very thorough and balanced training experience by focusing on three domains of learning - what we call knowing, doing, and being. Because MGSOM is church-based and utilizes the resources of the local church, including the pastor and leaders, it facilitates the growth and spiritual maturing of the host church at a minimal cost. Students will be prepared to lead local church ministries, to participate in international missions, and even to plant new churches. Local church leaders invest into the developing leaders in their church in a positive learning community. There are 36 modules (subjects) in the three-year curriculum, with 12 modules being completed each year. Classes meet one night a week for a minimum of 2 1/2 hours. The curriculum is uniquely based on three domains of ministry training: Bible knowledge (knowing), ministry skills (doing) and personal spiritual formation (being). In general, each quarter contains one class module from each of these three learning domains. When available, select books are used to add to the already thorough curriculum. Your church can host a Missio Global School of Ministry. Learn how!